Home»News»Latest Pompano Beach Real Estate Values- Is your home going up? 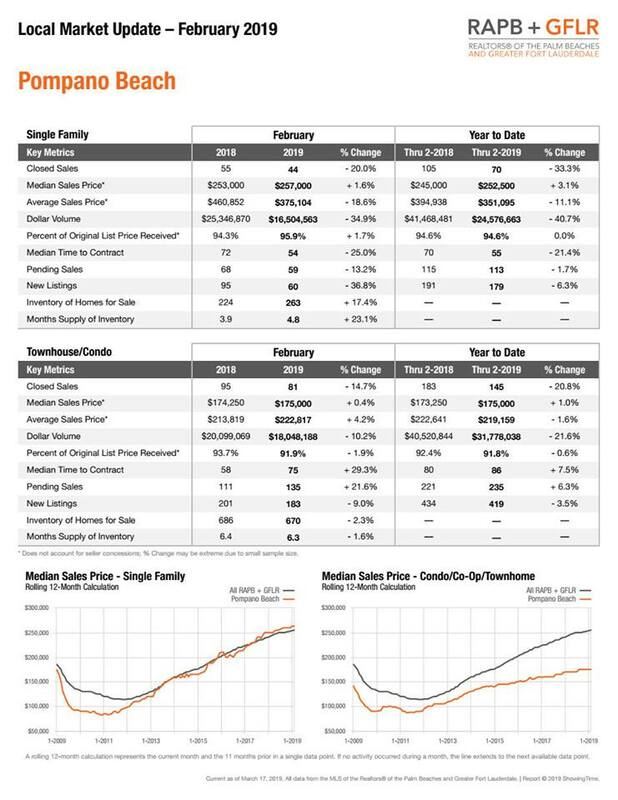 Latest Pompano Beach Real Estate Values- Is your home going up? Two months into 2019, here are the latest Pompano Beach Real Estate Values. The market has been slow. The number of Single Family homes sold in Pompano Beach is off 33% for the year; 25% in February. Condos are down 21% for the year and 15% down in February. However, prices have gone up slightly. The median price for a single family home in Pompano Beach is up to over $257,000. Percentage-wise the prices are up 3.1 % year over year and 1.6% in February. The median price for a condo in Pompano Beach is now almost $223,000. That’s up slightly year over year: 1.0% for the year and 0.4% in February. Wondering the current value of your home? Click here to find out. The chart below is courtesy of Sandy Seas Real Estate in Pompano Beach and Lighthouse Point. This story was prepared by our Pompano Beach news desk with info provided in the chart below. For more Pompano Beach news and things to do in Pompano Beach read Pompano! magazine and search our website.